Back In Stock...After their recent flurry on the transfer market, Hyperdub unleash their latest new signing, Darkstar. On their first release for the label, Darkstar donate two slices of juicy, tingling, infectious vocoder love that will have you leaking oil everywhere. 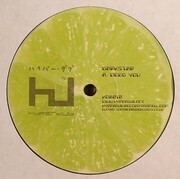 After two astounding but woefully under-rated releases on their own 2010 imprint, ‘Need You’ brings together their refined ear for a catchy melody and vocal earworm with some serious robot romance and silicon sadness. Despite still leaving us speechless, ‘Need You’ compels endless attempts at description ; UK garage meets Daft Punk meets Roger Troutman, or a hypothetical body-popping Burial releasing in 1982. Etc. Crunchy, harpsichord-like synthesized organs wrap around a descending bassline that strangely makes your jaws vibrate. Flip over for the weightier, slo-mo action of ‘Squeeze My Lime’, a lamenting, tangy synthesis of dub and hip hop from another dimension. Another totally unique release from an inventive production team fully deserving of the Hyperdub seal of freshness.